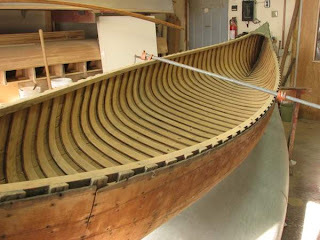 More work on the old Peterborough High End Champlain canoe. Lots of sanding of the old varnish residue, went through a lot of sandpaper and made lots of dust. The trim had been painted over, first red then green. 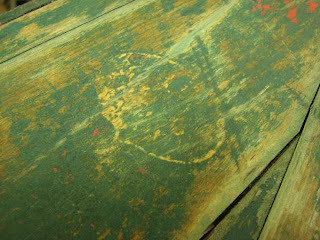 As I sand through the paint on the deck I can start to make out where the Peterborough decal would have been. I have been disappointed with my humidification in the shop. I have been using an old Vick's vaporizer, it works, but not well. I have been looking a the commercial units available and am not really impressed with any of them. Most higher capacity units are using wicks and fans, but the wicks mineralize pretty quickly and have to be replaced, at a pretty high cost! That got me to thinking about rigging up a unit myself, using the same basic ideas but using readily available hardware store and aquarium parts. Here is something that I rigged up using supplies that I had a around as "proof of concept". 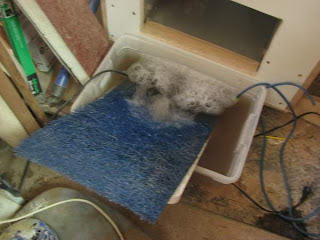 A tub of water, a pump, and a furnace air filter. It is sitting just at the out-feed of my room air filter with the air blowing over it. It works really well! Time to put together something proper. I was at my favourite woodworking store today, picking up some glue. They have started a fleamarket table, and I found this on it. I bet hardly anybody else had any idea what this thing was. 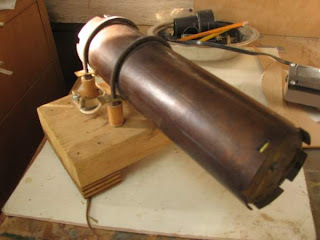 Its a hot-pipe for bending wood for musical instruments. I had the clerk test it out to see if it worked, it has an electric element inside. It didn't warm up, so they let me have it for free. I think that I can get it to work! Here is the Peterborough canoe that I am working on. It may seem that I am spending more time on the guitars than on the canoes, but in reality I am just taking more photos of that work.